Do you know that the office workload wrong distribution and cars waiting for the green traffic light are the same issues? If you faced the issue with the office workload wrong distribution, probably you tried many solutions. 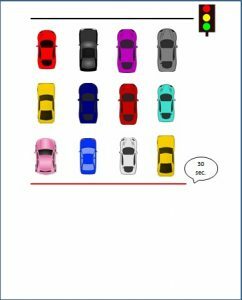 Here is an example for an easy way to overcome this issue using the comparison between the workload and the cars which are waiting for the green traffic light? First, let’s imagine how the cars look like at the traffic lights. What we can find is that the cars are not equally distributed in the columns. 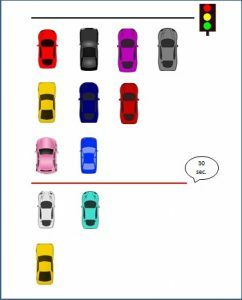 In the first and second column, there are more cars than in the third and fourth. So if a green light is lighting for 30 secs. and 10 secs. are necessary for one car to cross it means that for 30 secs only 3 rows of cars will cross. Three cars from the first and second column will not have time to cross. It is simple, right? What is the best distribution in this case? We need to re-order the last three cars in the third and fourth columns. They will also cross then (see picture 2). Exactly the same issue we can observe in the office where many tasks are not always equally distributed among the employees. As a result, some execute more tasks than others. How can we overcome this issue based on the cars example? First of all, we need to know what is the requested total time for the processing of all tasks. Next step is to find different times for execution of each individual tasks. Imagine that each employee is a column from the picture and tasks are the waiting cars. Finally, the last step is to distribute tasks between employees in a way that the sum of all task times per employee will be equal and not longer that the total requested time. Seems like it’s logical, right? Try it. And in the next post, you will find some additional tips for proper workload analysis.